On a recent morning, Ha Jin is waiting in the lobby of the Sheraton La Guardia East Hotel in Flushing at the last stop of the 7 train—the pipeline to Citi Field and to what has steadily evolved, since the sixties, into the second-largest Chinatown in New York. The Chinese-born American writer, who won the National Book Award for his novel Waiting in 1999, is visiting from Boston University, where he teaches creative writing and literature. He looks very professorial in a color-blind scheme of blacks, browns, and blues, and, because I am five minutes late, he’s poring over a well-thumbed copy of Graham Greene’s The Quiet American, which he slides into his blazer pocket. Jin, who has set seven of his nine works of fiction in Asia, chose to meet in Flushing because that is the setting for the stories in his new collection, A Good Fall—fresh territory for the author, who has placed his characters on U.S. soil only once before, in his most recent novel, A Free Life. The Flushing Main Street that appears in his pages is less a portrait of specific venues and more an evocation of a state of being—that of immigrants tethered to an insular community. Jin wants to take me to a Sichuan restaurant he likes that is always full of recent arrivals, but it’s not yet open for lunch. We settle on a diner nearby that serves milder Shanghai cuisine, though we’re both craving something spicier. If becoming an American was unexpected, becoming an American writer was unimaginable. Jin’s aspirations had always been modest: He wanted to be a translator, a desire born of his love of Hemingway and Steinbeck, whose works he’d first encountered in tone-deaf Mandarin translations (gently mocked in the story “Shame,” about a mediocre Chinese Hemingway scholar hoping to defect to the U.S.). 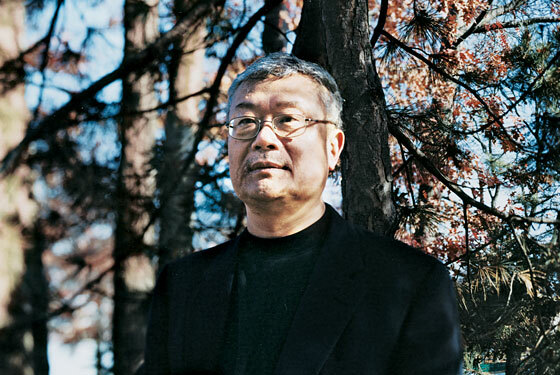 Until he learned English, Jin says, “I couldn’t see the small things, the stylistic inventions—they were lost.” But in his second year at Brandeis, Jin showed a poem he’d written in English to poet Frank Bidart, who read it on the phone to Jonathan Galassi, who was an editor at The Paris Review (and now runs Farrar, Straus & Giroux). Galassi immediately accepted it for the journal. Because of the poem’s political nature, Jin Xuefei became the pseudonymous Ha Jin, and he’s written under the name ever since.